This article is about the event summon stone. 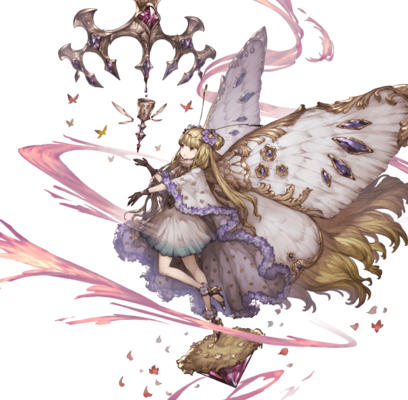 For the Premium Draw summon stone, see Sylph, Flutterspirit of Purity. The people affectionately call her "Lady Sylph" because of her airy appearance. She creates alma, a miracle elixir for immortality and everlasting youth, using the power of the dragon Fafnir. 20% boost to Fire Normal ATK. 20% boost to healing and healing cap. 25% boost to Fire Normal ATK. 25% boost to healing and healing cap. Duration: 180 seconds. 9T9 turn cooldown. This page was last modified on 3 February 2019, at 19:06.